….You can quote “Born to Run” verbatim, AND reference the chapter the aforementioned quote came from…. ….You refer to shoes as “foot coffins“…. ….You pronounce “huaraches” correctly (wah-rah-chiz)…. ….if given a choice between meeting the current US President, The Pope, and Christopher McDougall, the choice would be obvious…. ….You know who Zola Budd and Abebe Bikila are…. ….The “Leadville Trail 100” is on your bucket list…. ….people ask if you’re feeling “OK” if they spot you in shoes…. ….You can name the model of VFF someone else is wearing, even if they can’t…. ….You miss the VFF “Classics”…. ….You consider your Black VFF KSO’s “Formal Attire” because you colored the logo with a sharpie…. ….You know what “VFF” stands for…. ….People think it’s “quaint” or “funny” at a race, until you pass them…. ….After running a marathon or an ultra, you retain ALL of your toenails…. ….You have ever drawn a shoe logo on top of your bare foot to freak people out…. ….You despise the term “Barefoot Shoes“…. ….You know how to get the smell out of your VFF’s…. ….Chia seeds/pinole are essential to your diet…. ….You consider a 10k a “short run”…. ….You “finish” a run, and then decide to run some more…. 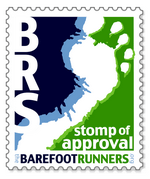 ….You have a blog about barefoot running…. ….You recoil in ABSOLUTE HORROR when you spot a runner heel striking…. ….You post a picture of your bare feet on Facebook after a race…. ….You tend to twist your ankle within mere moments of donning shoes…. ….You know who almost all of the following people are: Micah True, Eric Orton, Scott Jurek, Arnulfo Quimares, Ted McDonald, Christopher McDougall, Jen Shelton, Billy Barnett, Steven Sashen, Muddy J, Ken Bob Saxton, Jeff Gallup, Mark Lofquist, Justin Owings …. ….your children run barefoot as well…. …. You relate to this video:…. Have some more? Share them in the comments section below! lol…funny…love those videos, Steve Sashen is a comic genius, and should have his own show….you can be a regular…and from my standpoint, you don’t wear any makeup on your face , but can’t leave the house with chipped toe polish…lol…. Even though I’m fairly new to this I totally relate to almost ALL of your points. That’s awesome and I even know who all of the people on your list are. SWEET! Keep up the great work Muddy J!!! Being relatively new to BFR, less than one year, I was pleased that I could answer most of the questions. Keep on keeping on you BFR’s.